Our team of electrical professionals is able to quickly and accurately diagnose and fix a variety of electrical repair issues in Tampa, FL. 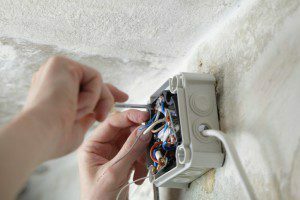 Are you having problems with your home or business’ electrical wiring? Puzzling electrical repair issues can pop up out of nowhere and create the potential for dangerous electrocution safety hazards and fires. Instead of waiting around to see if the problem will resolve itself, turn to us at 5 Star Electrical LLC for assistance remedying the issue. Our team of electrical professionals is able to quickly and accurately diagnose and fix a variety of electrical repair issues, such as service panel problems, outdated wiring, overloaded circuits, faulty switches, hot receptacles, improper grounding, and more. When you turn to us, you can rest assured that we will be able to take care of the problem in a safe and efficient manner. When you have an electrical repair job on your hands, we strongly encourage you to refrain from trying to tackle it on your own. Please keep in mind that electrical currents can be hazardous to deal with and can cause destructive fires if not handled with care. At 5 Star Electrical LLC, it is our job to shield you from this danger and handle the repair process so you don’t have to. Not only can we help you with all of your electrical repair needs in the Tampa, Florida area, but we can also provide you with safety tips to help you maintain the electrical system in your home and ultimately prevent it from malfunctioning. 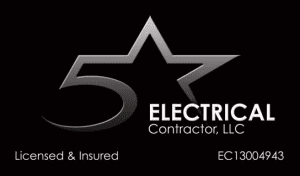 To find out more about our repair services or to schedule a time for us to come and help you out, give us a call at 5 Star Electrical LLC today.